What tyres to put on your 4WD? There are so many options and a huge range in prices. 4WD tyres are big dollars and are critical for safety so it’s an important decision. Our vehicle has been running Bridgestone Dueler D694 since the start of our trip around Australia. We got new tyres all round in preparation for the trip. After 14,000km it was time to complete a thorough inspection of the tyres and perform a tyre rotation. It was supposed to be 10,000km but I missed that appointment. This review is to provide you with feedback on my thoughts as of around 14,000km of travel. I’ve since done a new review after 48,000km, check it out here. Apart from potentially making your vehicle illegal, larger diameter tyres also effect the driveability of your vehicle. Larger diameter tyres essentially shifts your gearing up. This makes taking off more difficult, especially up hills or whilst towing, so can lead to more clutch / transmission stress. Larger tyres transfer more torque to your drivetrain, wearing out drivetrain components faster and increasing the risk of drivetrain component failure. Acceleration becomes poorer so the car feels like it has lost power. Some people counter this by fitting a diesel performance chip or re-gear the diff ratios. Low range won’t be as low, so the crawling speed of first gear may no longer be a crawl and the vehicle’s ability to ascend and descend very steep slopes will be effected. Larger tyres also make it harder for the brakes – you’ll have to push the pedal harder to get the same braking response. Large tyres also increase fuel consumption. The overall gear ratios are shifted away from the optimized values designed by the manufacturer. Larger tyres are also heavier and suffer from higher rotational inertia, further worsening fuel efficiency. These are things to consider before going up in size. The advantages of bigger tyres are higher ground clearance, larger rolling diameter which improves the ability of the tyre to clear larger obstacles, and more room in the profile to reduce tyre pressures. The 31 inch tyres I run are only slightly larger than factory on a hilux, so change in driveability is noticeable but not huge. The bigger the tyre, the greater the effect. It can be substantial. For me the tyres had to be all terrain and had to be light truck construction. Light truck so that they are more durable and able to withstand the strain of a heavily loaded vehicle and resist punctures and sidewall damage. Although light truck tyres may not have a higher load rating then a passenger tyre equivalent, light truck tyres are designed for a more arduous duty – carrying heavy loads all the time. They have greater tread depth, thicker under-tread rubber, heavier duty steel belts, thicker sidewalls and thicker beads. The other requirement for me was all terrain tyre – this means a strong 4WD spec tyre with a tread pattern that isn’t too aggressive. 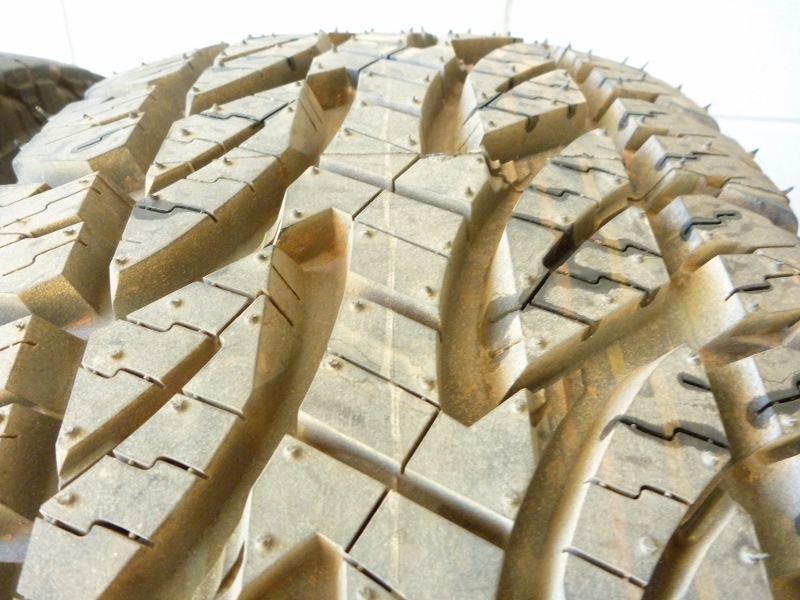 Mud tyres or aggressive tread patterns in general perform worse in every application except mud. I wanted a tyre with good tread life that would wear evenly on tarmac, be quiet at cruising speed and provide the best possible fuel efficiency. The offroad work that I do is mostly gravel, sand and rocks, where tread pattern doesn’t make much difference. So all terrain made sense for my requirements. I researched for light truck all terrain tyres with a good reputation for strength and durability. There’s plenty of options and I’m sure many do a good job. For me it came down to either the Bridgestone Dueler D694 or the BFGoodrich All Terrain T/A – a choice that many have considered before me. There’s plenty of discussion online to read about and heaps on American sites where the Duelers are called Bridgestone Revo 2. There wasn’t much between the Duelers and the BFGoodrich All Terrain T/A. Both seem to be a good tyre. The Bridgestone I have seen used often in mining which adds weight to its reputation. So I went for the Bridgestone. At the time of writing this article we had covered over 14,000km on our trip around Australia. The first 3,000km or so were around town before we left Perth. Roughly 6,500km has been on tarmac since then, leaving 4,500km of offroad work. Some of that was on graded gravel tracks. A large portion has been on unmaintained or poorly maintained gravel, rocky or sandy tracks including through Fitzgerald River National Park (including Point Ann, Quaalap Homestead, Tooregullup Beach and Gordon Inlet), Cape Arid National Park (including Poison Creek, Israelite Bay, Mt Ragged, Balladonia Road and Pt Malcolm), Davenport Range National Park, Davenport Creek, Transcontinental Railway Track, and Googs track. We have also driven on many boggy beaches along the way. We have traversed severe corrugations, deep soft sand requiring super low tyre pressure and one vehicle recovery, sharp stony tracks and steep deeply rutted rocky hills requiring first gear low range. Excluding tread wear which I’ll treat separately, the tyres look extremely good. Crisp edges, no cuts or gouges, no scratches or scuffs, no chips. Most people report some sort of chipping when touring a heavily laden vehicle offroad, but I couldn’t find any chips in the tread. Sidewalls look completely unscathed, although I do take care when on rocky terrain. I closely inspected all tyres from all angles and found nothing noteworthy. I was surprised – the car is hauling a lot of weight with the rear tyres carrying close to rated load and we have travelled over some ugly looking rocks and stones. I expected at least a few cuts, chips or gouges but couldn’t find anything more than a few tiny superficial cuts of a couple of mm length. These tyres have performed exceptionally well. Super grippy on dry tarmac – I have to stomp on the pedal surprisingly hard to activate the ABS, after which I must check that my eye balls are still in their sockets. They are excellent on wet tarmac. In the wet I’m able to accelerate fairly hard out of corners without any wheel spin. They work well at low pressures in soft sand. On gravel they are sure footed and dependable. They are quiet – I have not noticed any difference from the tyres that were on the car originally, although I have read that they get noisier as they age. Not much change to fuel economy either. I think fuel economy has worsened slightly, but I put that down to the larger diameter tyre. They seem to be strong – I am yet to suffer a puncture or any tyre damage at all even though I’ve covered some tough conditions in remote areas with a heavily loaded vehicle. Performance wise these tyres have exceeded expectations. In mud they are a bit slippery, as expected from any all terrain tyre. You may be getting the impression that these tyres are about to get the perfect review. That’s not the case. Unfortunately for my beer budget they will need to be replaced sooner than anticipated. They are wearing out faster than expected. I drive with extending my beer budget in mind, accelerating, braking and cornering slowly. My cruise speed maxes out at 100km/h. Often, if the wife doesn’t complain, I go 90km/h. I was hoping I’d get 80,000km out of these tyres in line with what I’ve heard reported for some tyres. That doesn’t look like it will happen. I have measured wear in meticulous detail. I measured tread depth on each tyre as accurately as I could using a strip of cardboard which I shoved into the tread, marking off the height of the top of the tread. I did this so I could measure all in one hit then enter the data later. It gave me a fixed record of the measurement which I could cross check against the data entry for any errors. I’m very interested in wear. Tyres are expensive, especially big fancy 4WD tyres, and a new set of tyres will set you back an inconceivable quantity of beer equivalence. I have constructed a table to record wear and calculate what I can expect to get out of these tyres. The worst tyre is already worn nearly 43% after just 14,000km. At that rate it will need replacing after 32,667km. Mind you that is a rear tyre, which has worn more than the front. After the tyre rotation the wear should even out. If wear is perfectly even, then I can anticipate the overall average expected life of 53,696km. Less if you consider it’s unlikely I can wear all four tyres out perfectly evenly. Well short of 80,000km. With the care I take and the price of these tyres (about $300 each), I expected better. Is it because the car is loaded so heavily? Is it because I have done plenty of offroad work? Is it because I have done lots of highway cruising on hot tarmac? Is it because tyre wear is not linear – they wear out faster at first and then last a long time? Or is it just because these tyres are not a durable compound. There is anecdotal evidence I have read that suggests they are soft. Maybe that is the price you pay for the good grip and resistance to chipping that these tyres provide. Although I have no first hand experience, I have read, as an example, that BFG T/A all terrains are slippery in the wet and are easily chipped. I have also read they last a long time. In my opinion, based on my experience so far, these are strong, good performing tyres. If you’re after a high performance, strong tyre that you can rely on in the outback and don’t mind paying a few extra dollars replacing your tyres more regularly, then these would be a good choice. For me, fast wear rate lets them down, but I can’t say if the level of wear is excessive or not. This is my first set of Bridgestone D694s, and this is my first trip with a car loaded for long term living. What are your thoughts and experiences? 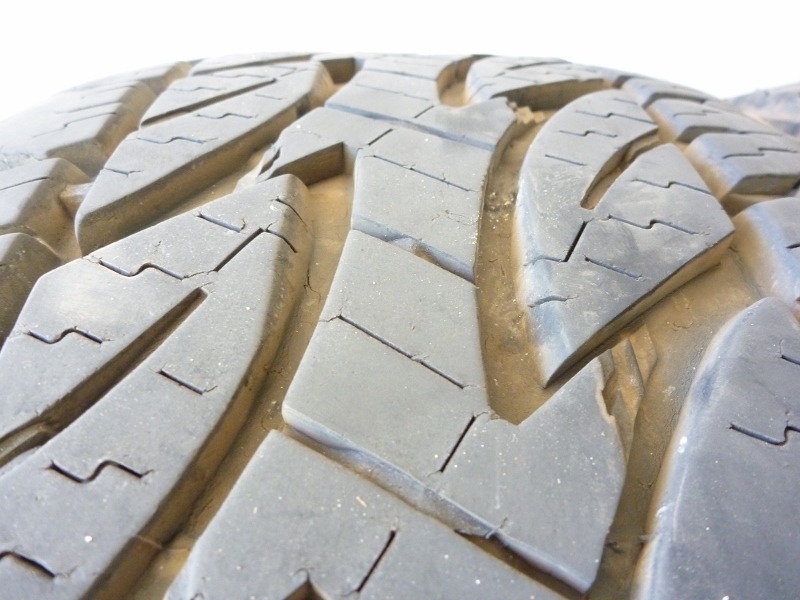 Does your experience suggest they are not a long lasting tyre? Or is their wear rate normal for the duty they are performing? How long do other tyres last in similar applications? Leave a comment below. If these tyres lasted 80,000km it would be a no brainer to get them again. If they last only 50,000km or less then I’d have to consider the BFGoodrich or something else to see how they compare. Or maybe I’ll try out the new Birdgestone D697 which have superseeced the D694 and supposedly offer superior wear life. As it turns out I was forced to try the D697s – check it out in the later review of these tyres. Like your tyre review. Just had a very similar experience with the same tires. Loved the way they worked but wear is just too fast to make me buy another set. Picking up a new set of Toyo OPEN COUNTY LT245/75R16 today and may do something along the lines of your blog with them. Anyway have a fun trip. Hi Troy thanks for your comment. Yeah looks like I’ll get something different due to wear rate, but I’m wondering whether harder compounds will chip and gouge more off road and be too slippery on wet bitumen. Might not be possible to have best of both worlds. Will give it a go with a supposedly longer lasting brand and see how I go. Good day Joe, I have the same tyres on my pathfinder, and I agree with everything that you have written, I have also found that on wet roads they perform better than any other tyre that I have had on previous vehicles but I am finding that the tyres are not wearing as quickly s yours. I have now had them on for just on 18000klm and the trip included the gcr the Donohue and plenty Highways and the Birdsville track. I have had the Bf Goodriche tyres on my hilux and they wore out just as quick as the Goodyears around 40000 klm’s and it also included a lot of side roads and dirt driving in sand and some mud we were unfortunate enough to get caught up in a summer storm in Queensland while off the beaten track, so I have now gone back to Bridgestone. and the verdict is not in yet as to how long they will last. thank you very much for the review. Hey BI howie thanks for your comment yeah the D694 are good performers that’s for sure. We’ll see how long they last. I think my next set will be BFG anyways just to be able to compare. An Excellent Blog, so detailed! I too had a keen interest in the Dueler 694’s and had a set as my first set on my 2010 Hilux TD Auto. I carry around 400 kg gear including canopy daily and got nearly 55,000 out of them with about 10% driving in muddy undulating hills and tracks for work. I also found the same – the first 35K the tyres were great, but the last 15,000 before i replaced them i became more aware of their limitations in the slightly slushy grass i was trying to drive on paddocks for work. By the way i have changed to cooper ST Maxx and done 35000 with them and have been happy – although they are noticeably noisier. I would suggest checking out 4x4earth.com.au for LOTS of comments/reviews/banter on all things 4×4 including comprehensive discussion on lots of tyres. Hey Matt yeah 55,000km isn’t enough from a premium tyre if others are getting 80,000. I’ll probably end up getting similar to you. Might try bfg next, then Cooper, a fair bit of fishing on my plate to get through all these tyres. Have you done much rocky stuff and have you found your Coopers chipping at all? I was surprised you went the Bridgestone over the BFG. Before I get into why the surprise, my personal 4WD tyre preferences are #1 – BFG A/T, #2 – Cooper ST (now replaced by ST Max) and I am about a 70/30 user in terms of highway/off-road split. Might give Yoko Geolanders a go next though, as I’ve been informed they now get good mileage. Used them years ago but low mileage from them. My personal experiences have led me to my preference for BFG. 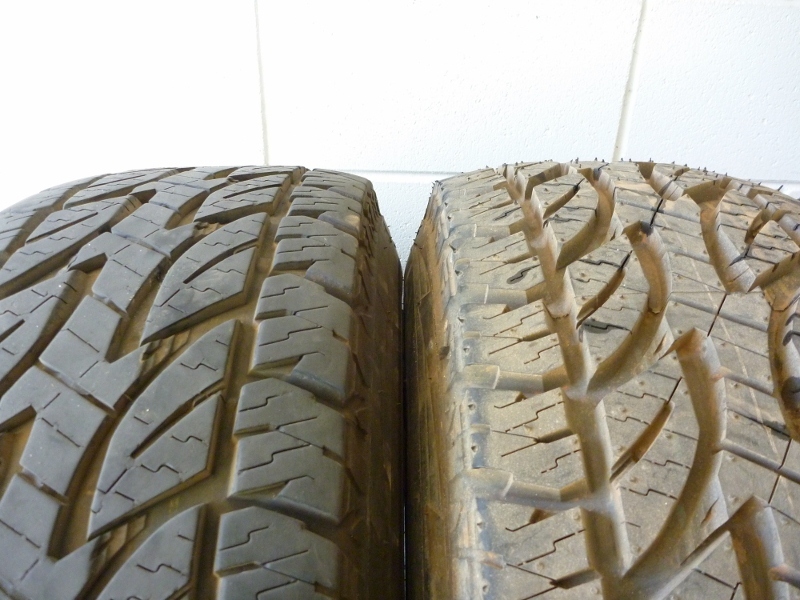 Two work cars (dual cab 4WD) came with the Bridgestone D694 tyre in 245/65/16 size – very disappointed by Bridgestone which I used to be a fan of. The 1st car, after 15,000km showed massive feathering despite proper alignment and pressure, which also created horrid road noise. Beyond 25,000km they were useless in mud. Had to replace them at 40,000km. Current work car (another dual cab) is showing similar signs at 15,000km – again. My current personal car (2007 Hilux SR dual cab) has 225/75/16 Cooper ST Max. 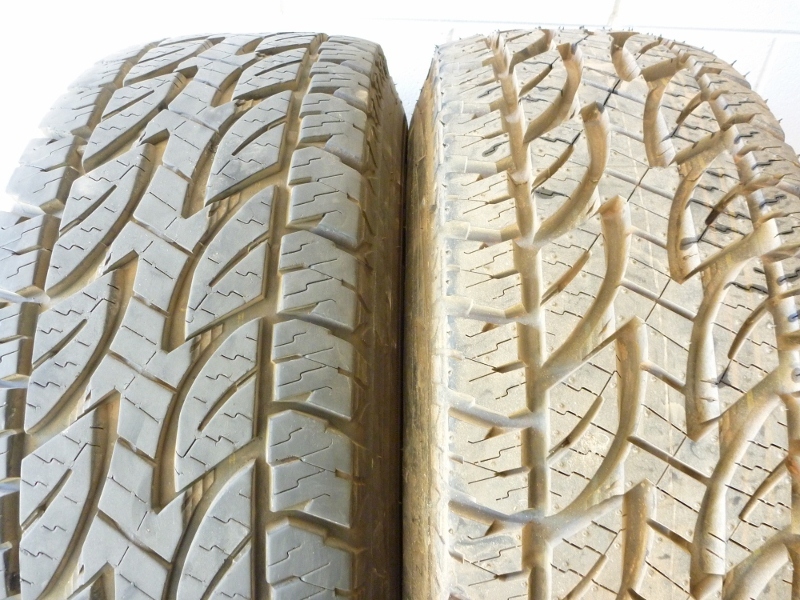 Great tyre, hardly any wear at 10,000km but give a bit of road noise and are terrible in soft sand as 225’s – side walls are too rigid, hardly any bulge. And then there was the 100 series before that, fully kitted out for touring, weighed a heap and had Cooper ST’s in 285/75?/16. Again, great tyre but the rigid side wall let me down on sand. I also had the tiniest twig penetrate at the join of the side wall and tread. Hope they’ve fixed that weak link. There’s more experiences I can tell, but these are the main ones that lead me to the BFG A/T. Hope this is of interest to you, and I look forward to seeing how your Bridgestones hold out. Safe travels. Cheers. Thanks for your comment, I think I’ll try bfg next because I’m certain my current tyres won’t go the distance,like yours did. I’ve heard the bfgs can chip more on sharp rocks and are less grippy on wet bitumen, maybe due to harder compound, hence longer life. But so much conflicting info, just need to give them a go I think once the Bridgestones are worn. Some good experiences with them like from yourself adds some weight to giving them a go. True, they are not a sharp rock tyre. But if you’re careful in those conditions and pick good lines wherever possible they should get you through. Even rock tyres get chips and chunks taken off though in extreme conditions. I never had an issue on wet bitumen in the cruiser, found them to grip well enough. The heavier vehicle might have helped here too. Like one should always do driving according to the road conditions and watching out for those that dont, and you should be as safe as you can be. had a new set of LT 694’s fitted to my 2009 Disco 3 and travelled approx 55,000km’s on them before i noticed a little bit of slipping in the wet on the tar. These km’s included over 25,000km’s off road incl trips to the cape and tassie on some narley tracks with a loaded car. I didn’t have a single puncture on any of these trips and the two punctures i did have were 20m from my driveway with 2″nails left on the road from a neighbours building site go figure!. I replaced them at the 55k mark even tho there was plenty of legal tread left as i was heading of on more trips offroad and wanted tyres in better then 80% condition. Fitted the new 697 LT’s and these are even better then the 694’s quite a bit quieter and then decided to trade the Disco 3 on a new Disco 4 so only did about 10000k’s on these. Bought new 18″Compomotive rims for the new Disco and the 265/65R18 LT 697’s are going straight on incl. the two spares. Hey Cameron Thanks for your comment. Yeah I wouldn’t hesitate getting them again if it wasn’t for the fast wear rate. They are a really good tyre in every other respect. Sounds like your wear rate wasn’t too bad if there was plenty of meat left after 55k. BFG may have superior wear life at the expense of grip like you suggest and also possibly poor chip resistance. I’ll probably end up giving the BFGs a go just so I can compare. I’d also like to try Coopers and the Bridgestone D697. I’ve got lots of kms to go! Hey Garry that’s interesting that your 694s lasted longer than your BFGs. Seems everyone reports different experiences but not many people have run both at the same time. Thanks for your comment. Well just bought a set of 694 LT’s 285/75/16’s used. Prod. date was late ’05 and previous owner used it for over 6 years, around 80/20 city/dirt. On average they have around 7-7.5 mm in the center and around 5 mm on the outer edge. Lasted pretty long and hoping it’ll last me at least 2 years worth of daily driving hahaha. Performed very well on mixed dirt,river,rock trails 😀 and happy with it. Better than my Yokohama Geolandar ATS. Love your review! This is the kind I’m looking for so I can compare these used 694LT’s I bought hahaha. Very detailed and straightforward. Gee them tyres are old and still going strong. Hopefully they last you. I have a Nissan patrol about to click over 400,000 km run only bridgestone duelers Lt 265/75 R16 694. I rotate them once at 40,000 km. All tyres balanced never run over 35 psi in any tyres. To much preasure wears out the the centre of the tyre tread. Worst run 63,000km best 92,000km. A fantastic tyre. About 60/40 on road and off. Carries about three hundred kilos all the time. Five punctures. Peter. Hey Peter seems like you get good mileage. What caused your punctures? Enjoyed reading this report – a lot of effort and plenty of facts. For interest, what are the axle loads of your HiLux over the weighbridge? I have a Series 80 with a legal GVM of 3.350 kgs and run the LT 694s at 38 on sealed roads and 28 to 32 on gravel at 80 kph. Have got around 45 000 from a set before I put them on the van (3 tonnes) with about 55% tread used. Hey Andrew I’ve never weighed my loaded hilux so can’t say for sure but I’ve done some calcs and I reckon fully loaded, fueled and watered there’d be close to 2 tonnes on the rear axle. 55% tread used after 45,000km is pretty good. Mine aren’t wearing as well. Thanks for your feedback. Hey Allein cheers for your feedback glad some stuff on here was helpful for you. Good luck! Hi.I had a set of new D694 Duelers put on my HZJ105 Cruiser 70,000 km ago. Lost 2 prematurely due to sidewall punctures, but the other 2 stood up ok, although by now they’re worn out n have to be replaced. Performed well on rocks, gravel and when running at 12-14psi on beach sand. No chipping or gouging, exactly as your experience. Over that 70.000km distance I’ve lost 5 tyres to sidewall punctures when running 22-28psi on very poor tracks. When replacing those damaged tyres I went the low cost way and tried Federal Couragia, Kingstar Dynamic and at the moment have a full set of Hercules Terra Tracs. The Kingstar was good value for money, unfortunately the Federal got punctured at 22,000km so can’t say bout the wear. In respect to wear I would say that the D694s were reasonable for the price. Hey John thanks for sharing your experience. 70,000km ay, I’d be happy with that. Yeah sounds like some of the cheaper brands are reasonable, but so hard to compare with so many variables at play. Do you know what’s the cause of all your sidewall issues? Your predictions for the front tyres are pretty close to 70,000, which makes it puzzling why the rear tyres are wearing fast. My front:rear weight ratio is 1:1.2, and I have fnt live axle. Can’t think of any other reason why ur rear tyres are wearing faster. The cause of my side wall troubles are the usual hazards on 4×4 tracks and off road ventures. Hard as steel stumps, twigs and branches on the ground, unfortunately sharp rocks and spinifex. If I was running highway pressure, 38-40 psi, the reduced bulging would have kept the sidewalls enough off the ground to prevent most of my punctures, but because of sandy or very loose rocky ground I reduce the pressure, otherwise I would probably be getting bogged all the time. Tyre brands differ in wear and I suspect that they also differ in side wall puncture resistance. Perhaps the Federal and the other brands have poor resistance. Thats why I’m experimenting and trying different brands. The Hercules Terra Tracs are heavier than the other tyres I have tried and I’m hoping this means the side walls are more solid and resistant to punctures.Time will tell. Hey John for almost their entire life my tyres have been on a heavily loaded 4WD, loaded for long term touring, doing highway speed on hot tarmac. Most of the weight is in the back which could explain the high wear but I don’t have any baseline to compare to. Highway pressure tyres are more prone to fail from impact fractures. In terms of tyre safety, best off road pressure is less than highway pressure but more than sand pressure. It’s a compromise between protecting the sidewalls and minimizing impact fractures. The other plus of reduced pressure is less broken stuff on the car like suspension components and any other items you have in your car that fatigue from impacts and corrugations. Will be interesting to see how the other tyre brands cope. PS just a quick observation re pressures. When on hwy I have my tyres at 38-40psi, whereas your tyres are at 45 & 50 and you have measured the centre wearing faster than the edges which would be consistent with having the tyres over inflated. Does that make sense? yeah could be too high pressure. I have not put my car on a weighbridge but I’ve calculated based on the stuff I’ve got in it and the factory weight on each axle that the rear tyres would be close to rated capacity which means they need to be close to max pressure. Combine this with doing lots of highway km on hot tarmac, I put the rear tyres at close to the max rating of 50 psi and the front tyres a bit less, to ensure adequate load carrying capacity and minimize heat load. But I think I’ve probably set them slightly high. Great blog and good work making all the measurements. I agree with some others that your tyres were over inflated, even at full load. You might be getting slightly better fuel consumption with the higher inflation though to consider in the beer-mathematics, but as this is to do with tyre wear I’ll stay on track. From your measurements most of your tyres are wearing more in the centre, consistent with over inflation. I have been recommend around the 40psi mark for the rear when loaded and 32-36 in the front depending on how it feels. Your worst wearing tyre, the rear left, is often the first to go. It’s the one carrying the load on the rough edge, the one that gets tossed off the bitumen when you have to make room for someone else. Consequently the suspension also wears faster on that side and the I wouldn’t mind betting the pic of the worn bush on your blog is from the rear left? If the suspension is wearing it will change the load and wearing characters of the tyre too. I have an older ’98 hilux dual cab with 31×10.5×15 too. I bought it second hand so there are the unknowns of its history that come into play. I’ve been working through a few pairs of tyres at a time to get a feel for their wear. I also had the rear leaf springs adjusted to level (not lifted) and found the left spring had sagged almost 2″ probably due to the extra abuse the left side gets. I tried some Cooper Discovery ST but they don’t like the tropics or heat so wore quickly up north and started to fall apart. I found out that Cooper doesn’t offer their km warranty on tyres sold in the NT north of Alice Springs so I guess they’re not made for that climate. I had a pair of (I think) Michelin AT of some type. These wore very quickly in Northern Aus and appeared to chip and started cracking without much wear. I haven’t written down how many km’s probably to help forget that I ever wasted the money. I was told to run these at 40 psi all round an think that the tyre and vehicle wore badly as a result. I currently have two different pairs of AT tyres on now. A pair of Dunlop Grandtrek AT3s that have done about 30,000 and look to be wearing evenly with minimal chipping and maybe 50% worn (without measuring). There are fine cracks forming between the tread and I’m not sure how they will hold up from here on. The other pair are the Bridgestone Dueler AT D697 with about 20,000 km. These are also wearing evenly and at a similar rate as the Dunlops. There is no chipping but again fine cracks are forming that I’ll keep an eye on. These look like about 30% wear from eye but not measured. At the moment I’m happy with both of these tyres in the road noise, handling and wear. To compare, I seldom carry more than 500 kg with full touring/camping kit and have tyre pressures at 36 rear – 32 front on the bitumen. For fast gravel highways I follow the experience of the Pink Roadhouse legend Adam Plate http://www.pinkroadhouse.com.au/travellers/tyres/ but only for those conditions such as the Oodnadatta track, Plenty Highway, Gibb River Rd. Lots to learn but an expensive hobby to make experiments with. Cheers, I’m off to find a good spatula! Hey Al thanks heaps for your feedback. You have some good experience with tyres. Looks like hot roads do wear tyres out a bit faster which explains my tyres a little. I agree I think I had mine a bit too hard but they were getting freakin hot at highway speeds in the NT and they would have been close to rated load with all my gear. I’d rather slightly uneven wear than a tyre blowout. Plus a few % fuel saving according to mythbusters which hopefully cancels out the wear and keeps beer budget in check. On gravel I definitely reduce tyre pressure, from 3/4 down to maybe 1/2 highway pressure depending how rough it is as I identified in my tyre pressure guide. Both sides of my rear suspension had shagged bushes. They’ve been hammered for thousands of km of offroad and corrugations with a full load. I’m just about to publish an updated review on my tyres at 48,000km. They’ve done pretty well considering the abuse but still worn a bit fast. Yes get a spatula and start opening beers in the coolest way known. 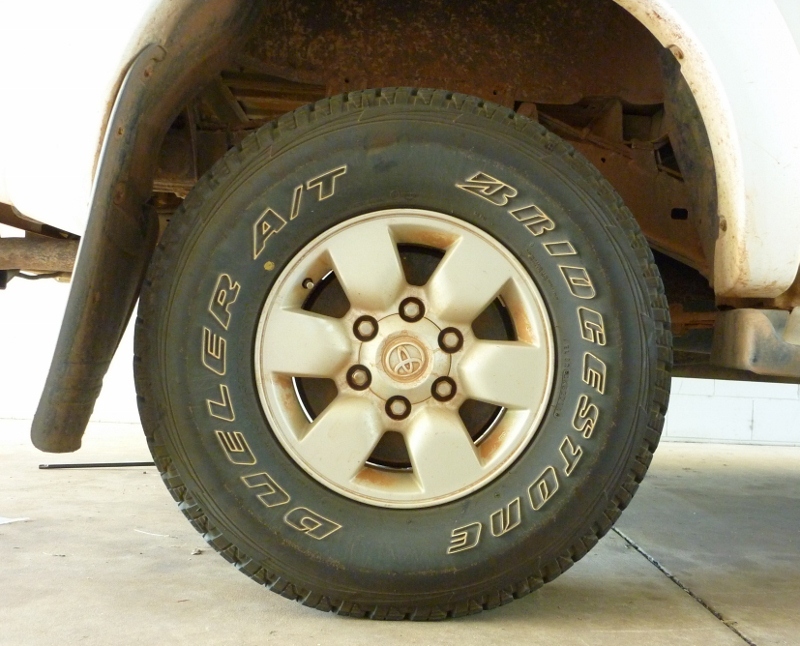 The mighty 694LTs – we were having dramas with tyres on our Hiluxs deep in the Pilbara. The cars were doing up 3000km a week on dirt roads……bad dirt roads. They never ever see the black top. I’ve got some pictures I’ll try and dig up some pics of our tyres after 18000km, just about stuffed. Speeds on average were around 80-90km/h. After continual punctures we tried the 694LTs. Geezuz what a tyre. These things would go to the canvas before puncturing. Without a doubt THE toughest tyre we have ever used period. We have been using them for about 8 yrs now and we will not change.